You might also like to sing songs on the theme of Peace (some songs listed here). Any Holy, holy, holy will work well (Here's a list). MV008 And on this path (Linnea Good) An energetic gospel style song. Here's a youtube video. We sing it much slower than this and as a gospel style song with big chords and a groovy bass part. I thought I'd never say that we sing something slower than anyone! Good for kids. PfAS118D This is the day the lord has made (Joy Patterson) A good 7/8 setting of the Psalm. It will need to be taught, but will be enjoyed. Sheet music and lyrics. MV122 Online Resource This is the day (Bruce Harding) This is a really simple nice jazzy song. Sound sample. Sample sheet music. Good for kids. *Recorded Music Odecha (Yasmin Levy) This is something quite different, but will fit well with some services, particularly while reflecting on Christ's journey in the coming week. Yasmin Levy is a Sephardic Ladino singer (yes, Ladino, I had to look it up too). I really love this sorrowful but also hopeful version of the Psalm; it focuses entirely on vs 21 and 22. Sound (Youtube). PfAS118G This is the day the lord has made (Leon Roberts) A bright and cheerful refrain for the Psalm. *Taizé / MV016 / StJ / ELW528 / GA430 / SFFS 2157 / HPP410 / GtG466 / G(II)398 / GC570 / GC(II)550 / G(3)637 / CP402 / URW378 / Lau701 Come and Fill our hearts/ Confitemini Domino (Jacques Berthier) Can be sun in English as "Come and fill our hearts with your peace, you alone O God are holy. Come and fill our hearts with your peace, Alleluia". A good song of recommitment. Obviously if you don't sing Alleluias during Lent, this is not for you. You could replace the Alleluia with Hosanna if you really want to sing it. Sound samples and sheet music. TiS 279 / AHB 212 / SFFS 2091 / HPP158 / GC487 / GC(II)494 / G(3)572 / CP632 / Lau107 The King of glory comes the nation rejoices (Willard Jabusch) Fun and energetic song to a traditional Israeli folk melody. A good processional. Lyrics (scroll down). Watch Stephen Colbert crack some fancy dance moves to this song. Good for kids. *CH366 / AA022 Come into the streets with me! (Shirley Murray) Simple folk tune which is great for kids; chorus is "Come and follow my leader". A good fun choice for Palm Sunday. Lyrics. Good for kids. StS073 / SP&P132 Jesus is coming / Pave the way with branches (Bret Hesla) Palm Sunday this song has a great rhythm; in SP&P they suggest singing "Pave the way with branches" rather than "Pave the way wth justice", but I would stick with the year-long version. It would be great for kids, and good for drumming. It's very repetitive so good for kids and non-readers. Other verses include "Hope for the downtrod / Pave the way with justice" and "Debts are forgiven / Pave the way with justice". 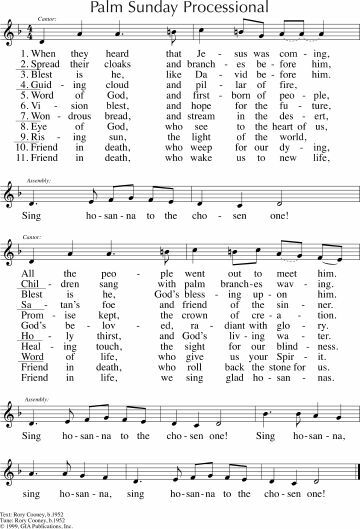 One year we sang it, with a very strong cantor, all the way up the street to our ecumenical Palm Sunday service. It worked really well! Lyrics (in a full order of service) Good for kids. VU128 / A&M162 / GtG597 / W&R269 / SP54 World Council of Churches Assembly 1991 Sanna sannanina An excellent African processional, which simply means "Hosanna". GtG has the option of singing the Holy Holy to this tune, but I think that just seems a bit odd. Great for drumming. Sound sample (scroll to the 2nd album). Sheet music sample. Good for kids. SFFS 2109 Jesus rode into Jerusalem (Cathy Townley) Fun call-and-response song. Lyrics. AoV1-061 / ATOK 355 / GtG359 / SFFS 2194 / G(II)521 / GC723 / GC(II)707 / G(3)814 / ZSS110 / SgTJ1035 Freedom is coming (South African) Excellent and lots of fun, especially if you have a keen African-style drummer in your congregation. It's really worth teaching the parts to your congregation before the service. It can get a bit confusing for the congregation otherwise. European choral version on Youtube. Good for kids. SFFS 2111 We Sang Our Glad Hosannas (Mary Nelson Keithahn) Good words that follow Christ from Palm Sunday to the Crucifixion. Sung to a hymn tune. Lyrics. Online resource From the East the Poor are Marching (Daniel Damon) Based on the writings of Borg and Crossan, this hymn speaks of the two processions coming into Jerusalem on Palm Sunday - the peasant procession with Jesus, and the Imperial procession with Pilate. Sheet music and lyrics. GA312 Hosanna to the son of David (Jane Wood) A simple and energetic Hosanna. GtG200 / Cha193 A Cheering Chanting Dizzy Crowd (Timothy Troeger) Lyrics are great; pretty solemn at the end... There are two possible tunes; I prefer it to the well known folk melody MORNING SONG (TiS 172), but this requires repeating the last line. Some lyrics and a reflection on these words (scroll). Tune sample. Iona (The Courage to Say No / Enemy of Apathy) Travelling the Road to Freedom (John Bell) Easy tune and excellent words. Who wants to travel the road with me? Lyrics (search for "travelling". The liturgy is also really good!). Sound sample. ATW 444 Hey King (Paul Grant & Marion Palmer) Good for kids. What sort of King was Jesus, anyway? My niece was obsessed with this when she was 7. Good for kids. *MV 128 / GC(II)420 / G(3)496 When they heard that Jesus was coming (Rory Cooney) A simple and excellent antiphon (led by one singer, and a simple repeated chorus by the congregation). It has 11 verses, so you may want to just chose the ones that fit for your service. Just the first 3 would do the trick for Palm Sunday really. It would work really well to help the whole congregation tell the story, and fun for kids. Lyrics and sample sheet music. Sound sample. It could be sung much more energetically than the sound sample. FFS18 For the crowd another busy day (Colin Gibson) Tune might be a little tricky, but the words are really excellent. TiS 357 / ATA 147 When his time was over the palms lay where they fell (Robin Mann) A quiet and mournful song that would lead well into Holy Week if you wish to end your Palm Sunday service on a more sombre tone. TiS 244 / AHB 187 Trotting trotting through Jerusalem (Eric Reid) An old favourite. Lutheran Service Book No tramp of soldiers marching feet (Timothy Dudley-Smith) Pretty good words, and sung to a familiar folk tune (STAR OF THE COUNTY DOWN) or to KINGSFOLD. Lyrics. New words to old tunes. G(3)499 Blessed is He / Hosanna (Scott Soper) I think the sound sample of this makes it boring, but it could be quite energetic with drums etc. Sheet music. Sound Sample. *NCH214 / UMH279 / GtG199 Filled with excitement / Mantos y palmas (Rubén Ruiz Ávila) Fun and joyful verses, with an energetic chorus. Can be sung in English or Spanish. Best with percussion! Good for kids. Recorded Music Hosanna (Page CXVI) Not a congregational song. If you've got hipster musicians, they could play and sing this maybe? Sound sample. Youtube with lyrics. VU124 He came riding on a donkey (Gordon Light) Good words and a simple tune to sing. Thanks to Craig Miller for suggesting this song. What will you be singing as you wave the Palms this week? Add a note in the comments - I'd love to hear your thoughts! and thus transform the human race. There are specific song lists for Lent and Holy Week days. Hi Natalie: I use your site a bunch. Thank you for the good work. Hi Natalie, Love your blog and use it regularly. Check out "He Came Riding on a Donkey"(1986) by Gordon Light in Voices United 124 for Palm/Passion Sunday. Our congregation loves this one. Easy to sing. 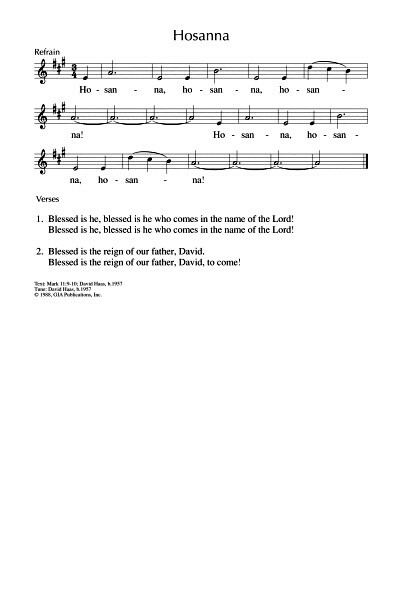 Hey Natalie, do you have a copy of the Page CXVI holy week EP pdf music sheets? I can't find mine anywhere and its not on their website anymore.